Welcome to Connecticut Waterfalls. This site is part of an ongoing project where I hope to visit every natural waterfall in the state. Here you will find a catalog of the waterfalls in the state. As I visit each waterfall I will take pictures and measurements and post the results here. This site will only include natural waterfalls. By natural I mean falls that were created by nature not by man. Thus the outflow of dams does not count. The waterfall does not need to be in a purely natural setting. Waterfalls that are part of parks and have been turned into recreational areas are listed. Natural waterfalls that are being destroyed by man or have ceased to exist could also be listed. 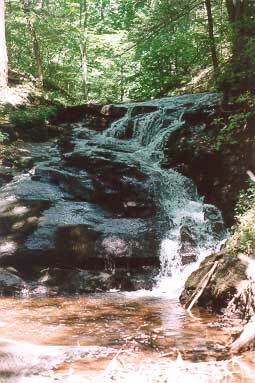 The site also includes waterfalls that are on seasonal streams. Your help is needed in identifying more waterfalls. I have been unable to find a comprehensive catalog of the waterfalls in the state. The list presented here comes from many sources, book, newspapers, my travels and word of mouth. If you know of other waterfalls not listed, send me E-mail and I will be sure to include them and pay them a visit. Enjoy the site. But most importantly get outside and see some of the beauty of our world with your own eyes and ears.